Here's what the YouTube Gaming homepage looks like. 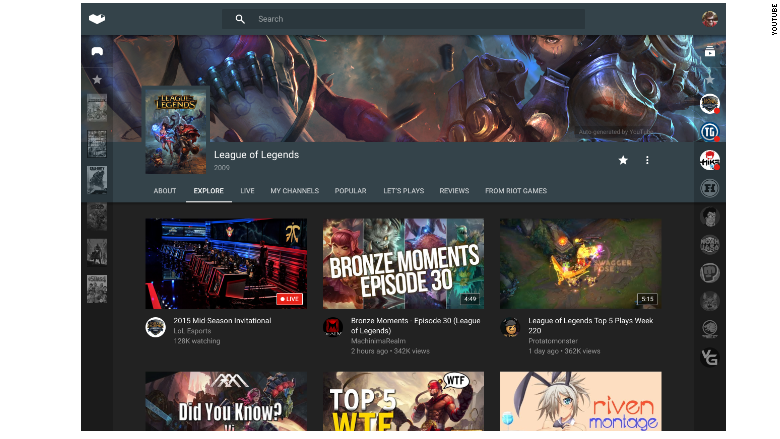 YouTube will launch its own dedicated mobile app and desktop site for video gamers later this summer, starting with the United States and United Kingdom. YouTube Gaming is a combination of e-sports, social media and live-streaming. The new platform will consolidate video game content from across YouTube, offering gamers a single place to watch, share and stream live gaming play. More than 25,000 games will each have their own page. Channels from game publishers and YouTube personalities will also be on the app. Users will be able to receive notifications as soon as a player begins a live stream. "When you want something specific, you can search with confidence, knowing that typing 'call' will show you 'Call of Duty' and not 'Call Me Maybe,'" YouTube product manager Alan Joyce said in a blog post. Announcement of the new app should come as no surprise to anyone who has been watching the e-sports entertainment space. This is Google's response to Twitch, Amazon's multi-platform gaming video company that attracts more than 100 million unique visitors a month. Google (GOOGL) tried to acquire Twitch unsuccessfully, and Amazon (AMZN) snatched it up or almost $1 billion in cash last year to boost its own digital media offering. Live streams will be featured prominently on the YouTube Gaming homepage. The app will also feature high frame rate streaming at 60 frames per second, which YouTube recently launched. It will also support the automatic conversion of streams into YouTube videos. YouTube is also redesigning its system so that broadcasters no longer have to pre-schedule live events. Joyce says there will also be a single link for all of a user's streams.